The Northwest Reference Epigenome Mapping Center aggregates leading experts in human embryonic stem cell (hESC) biology, lineage-specific differentiation of hESCs, and well-established differentiating and differentiated adult primary tissue systems to establish a substantial capacity for the production of purified cells and tissues for large-scale epigenomic studies. This cooperative effort, consisting of scientists at UCSF, UC Davis, UCSC and the British Columbia Genome Sciences Centre, and working with the Data Coordination Center (EDACC) is comprehensively mapping epigenomes of select human cells with significant relevance to complex human disease. 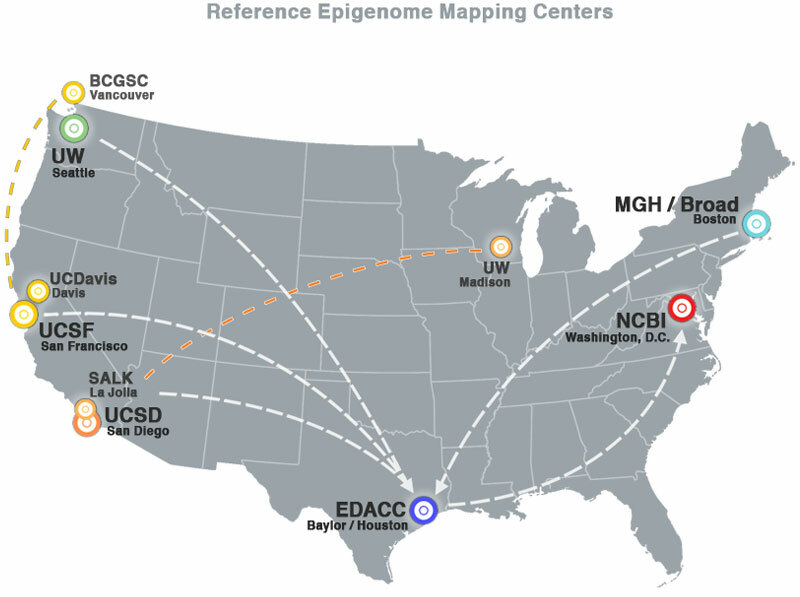 The Epigenome Center in San Diego focuses on both undifferentiated hESC and four hESC-derived early embryonic cell lineages including extraembryonic endoderm, trophoblast, mesendoderm (a common precursor to mesodermal and endodermal lineages), and mesenchymal cells (a specific mesoderm derivative) in order to gain a better understanding of the epigenetic mechanisms regulating differentiation of hESCs, and produce general reference epigenome maps of the human cells. The Reference Epigenome Mapping Centers (REMC) aims to transform our understanding of human epigenetics through production and integrative analysis of comprehensive reference epigenomes for ES cells, differentiated cells and tissues. High-density microarrays and next-generation sequencing technologies, coupled with the availability of the annotated human genomic sequence, are opening a road toward a comprehensive mapping of molecular epigenetic patterns. This project aims to develop networked cyberinfrastructure and employ it to integrate and coordinate data analyses and data pipelines involving designated Reference Epigenome Mapping Centers (REMCs), NCBI, and other participants.